STETSON OIL COMPANY CLEVELAND, OHIO. 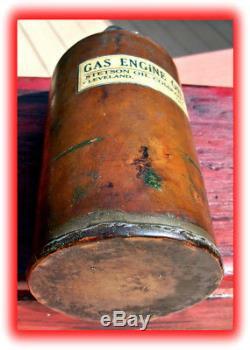 Copper oil can with soldered joints, very good condition label/decal! Rubber composition stopper/lid, no visible cracks or holes. 3" diameter x 7" High x 1 diameter spout. Wooden tool box, double-hinged, with leather oil can retainer. Worn, cracked, used, but in great condition for it's age. Tool box retains old red/black paint & stain. Mounting hole on base, wood is cracked/dried-out. Outside dimensions: 17" Long x 6-3/4" Wide x 5-3/4 High. Inside dimensions: 12" Long x 5-1/4" Wide x 4 High. Total weight of tool box & copper oil can: 5 lbs, 4 oz. Well, if you are a vintage oil can collector or a Hit'n Miss gas engine person, this is something that you don't find every day! 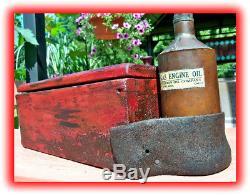 A beautiful tool box with a 1-of-a-kind "gas engine oil can". It would appear that this is an original, complete, tool box with oil can combination. I don't see any names or numbers on the wooden tool box. The item "Hit n Miss Stetson gas engine oil can & wooden tool box combination" is in sale since Saturday, August 11, 2018. This item is in the category "Business & Industrial\Light Equipment & Tools\Stationary Engines\Parts". The seller is "okmnx" and is located in Bath, Pennsylvania. This item can be shipped to United States.